By 1948, everybody knew the party was almost over for Beau Jack. The former lightweight king and the all-time champ when it came to headlining main events at Madison Square Garden, Jack had always brought out the big crowds thanks to his swarming, fast-paced, wild-swinging style, but Philadelphia’s Shibe Park was barely half full for the first clash in the Williams vs Jack series. Those that came were treated to a brawl for the ages and a finish that left even the most hardened of fight fans shaking their heads. Knowing this makes the frightful conclusion to the first Williams vs Jack contest even more difficult to watch. The result itself was shocking to few. Going into the match, few gave Jack a serious chance of defeating champion Williams, one of the deadliest punchers around. 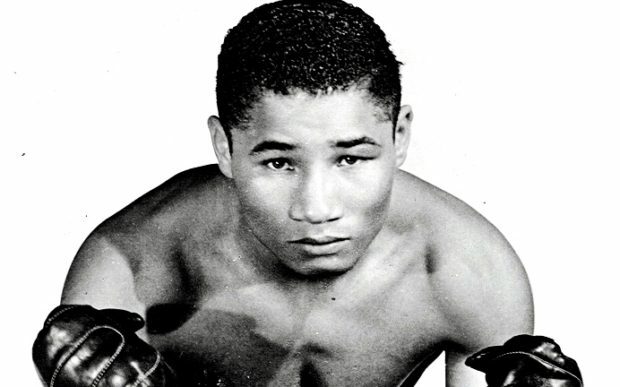 He had already stampeded through the lightweight division, knocking everyone out including Bob Montgomery and Bobby Ruffin, boxers who had bested Jack in recent outings. 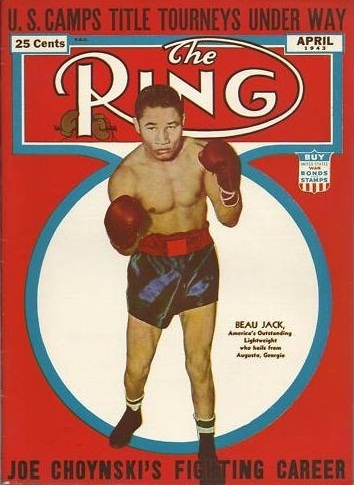 Beau hadn’t made the lightweight limit in over four years and after all those wars with the likes of Montgomery, Ruffin, Tippy Larkin, Sammy Angott, Henry Armstrong, Fritzie Zivic and Johnny Bratton, people knew the best of Beau Jack had already come and gone, though his best performances would be long remembered. Heart and courage like Beau Jack’s remains a rare and splendid thing to see. But to everyone’s surprise and delight, for three rounds the brave Jack turned back the clock. 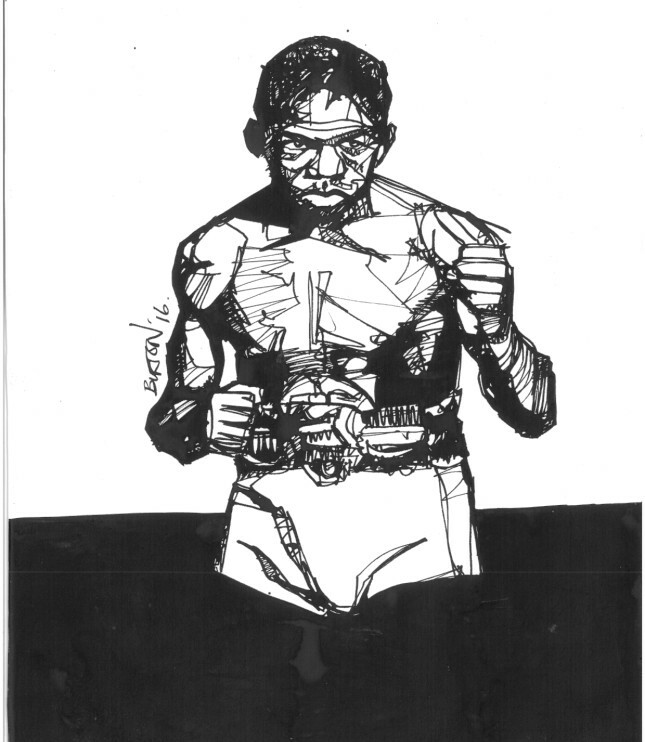 He put the champion on the defensive, as he threw his left jab with abandon, snapping out five or six at a time. Bobbing and weaving as he bulled forward, Jack slipped under the champion’s jab while landing his own and moving inside to throw vicious uppercuts and hooks. Williams fired back and the exchanges on the inside were furious. Towards the end of the second, Jack landed a series of cracking left hooks and then a huge right that stunned Williams, forcing him to clinch. At the end of the round Beau trapped Williams on the ropes before landing another big right. 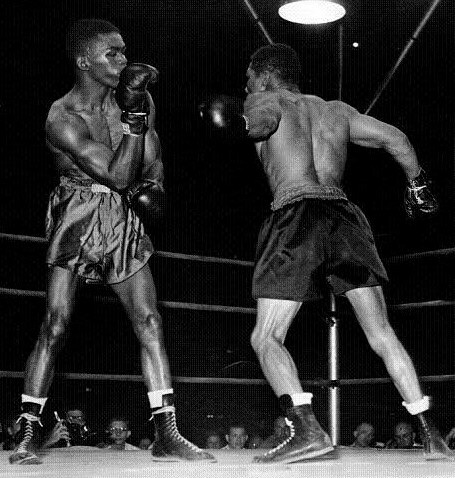 The slugfest continued in the third with Jack forcing Williams to clinch again after landing another wild right, but the champion’s shorter, sharper punches were starting to carry the day. Williams was timing the smaller man and beating him to the punch. In the fourth he began catching Jack on the way in, hurting him with counter rights. A suddenly tired Jack had lost the snap in his jab and Williams was muscling him about the ring and battering him. The fifth began as a toe-to-toe slugfest, both men getting home big shots, but with Williams clearly the more powerful puncher, this had turned into a match Beau Jack could not win. To his credit, he never gave up, never stopped trying to land the big wallop that might turn things around, never stopped giving the fans that heart and courage they loved to see. But by the end of the round there was no denying the champion was now in firm control while the challenger was spent, a worn-out husk of a once great and indefatigable warrior. Smelling blood, Ike landed three solid rights followed by a left and Jack sagged, the round ending before Williams could take advantage. But the challenger was finished. He had given all he could. Regretfully, he would have to give more. A hurt and exhausted Beau Jack stumbled out of his corner to start the sixth and Williams wasted no time deciding matters. Encountering virtually no resistance, he stepped in and let his hands go. A series of solid punches ended with two devastating lefts that stunned the challenger and sent him reeling backwards into the ropes. Sensing the finish, Williams unleashed a furious, rapid-fire attack, battering his defenseless opponent with both fists, seemingly every punch landing, the barrage viciously snapping Jack’s head from side to side. Out on his feet, the challenger staggered into a neutral corner. Trapped there, the ropes holding him up, his hands off to each side and his head an exposed target, Beau Jack’s huge heart and immense courage had finally betrayed him. 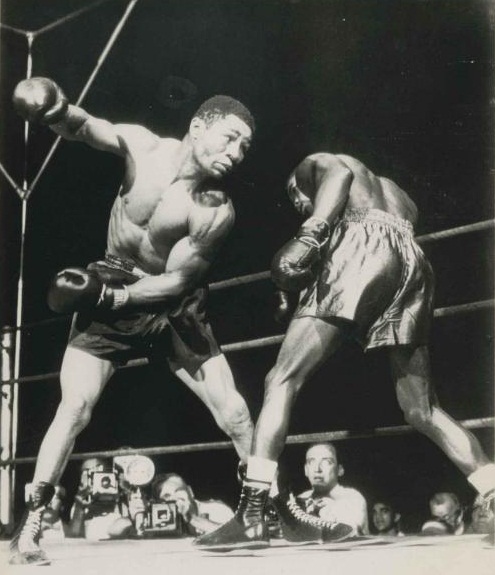 Too gutsy for his own good, he stood and absorbed a truly sickening beating, blow after blow raining down, Williams pausing in his attack to turn to referee Charlie Daggert to make sure he really wanted the massacre to go on. Incredibly, as Beau Jack simply stood there and stoically awaited his execution, the referee signaled for Williams to continue. The champion landed four more heavy shots on his helpless opponent before Daggert, finally coming to his senses, leaped between the two warriors and signaled the end.